A few minor tweaks and changes are what you'll find with the 2019 370Z, which is the Nissan innovative two-seat sports car. 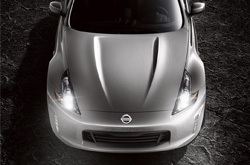 The Nissan 370Z is still produced in three body styles, which are the Nismo, Roadster, and Coupe. Standard updates and improvements for all trim levels will be offered in this newest update. 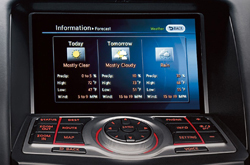 The most changes, however, are found in optional add-on packages. With a performance-ready look inside and out, this car is a sports car fan's delight. The base model, which is simply called the 370Z, has HID headlights, black aluminum alloy wheels, a panoramic rearview camera, and a 3.7L, six-cylinder engine. It also has a remote entry and push-button start, which makes it easy to unlock the car without having to dig into your pockets or purse. 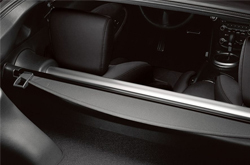 The 370Z also has a hidden box and a cargo cover that can be used to keep valuables safe when you're not around. Another nice feature of the 370Z is its wide-opening hatch door in the back, which leaves plenty of room for storing suitcases, golf clubs, snowboarding gear, and more. The Heritage Edition builds on the base model's amenities with unique yellow trim stitching accents throughout the interior. It also has a leather-wrapped steering wheel. Custom exterior graphics give it a distinct look on the road. The Sport model has special sport brakes and a rev-matching transmission. A premium Bose sound system is optional. The top-line Nismo adds an aerodynamic body shape, custom wheels, and a fine-tuned suspension system. 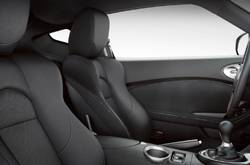 All trim levels of the 370Z are powered by a six-cylinder engine. The 3.7L engine produces a maximum of 332 HP at 7,000 RPM and 270 LB-FT of torque at 5,000 RPM. The engine has twin turbos, which makes it adept for both performance and speed. In the higher level trims, it is paired with sporty brakes to enable fast braking when needed. Depending on the trim level, the engine is matched with either a six-speed manual transmission or a seven-speed automatic transmission. The automatic transmission on all models has a continuously variable (CVT) technology. Is Safety In the Forefront of the Design? The 370Z has a comprehensive safety package that includes a backup camera, an anti-lock braking system, and electronic brake force distribution. The brake force distribution feature sends power to the rear brakes if it detects added weight to give the car maximal braking power. If you understeer or oversteer on the road, vehicle dynamic control steps in to reduce engine power and engage the brakes so that the car stays on its desired trajectory. Pretensioners in the seat belts provide extra restraint if the airbags are deployed, and active head restraints reduce the risk of injury from whiplash caused by rear collisions. If you are interested in a test drive, please visit Trophy Nissan in Mesquite today!